I have a slight obsession with making caramels. I love the burnt sugar smell, the rolling boil, the slam of vanilla scent. Of course, I enjoy eating them too but I usually make a batch and give away ¾ of them. Today as I was stirring, I was plotting my new novel in my head. (I cook more frequently when I am writing. Particularly anything that has a lot of stirring or chopping.) As I browned the butter, making sure to not to scorch the delicate butter, I considered my protagonist, Aubrey. She is one of those characters who can be very sweet but who were nearly ruined by too much drama, too much heat. She is much like my caramels. You can feel the danger when you eat a good piece of caramel. Both the butter and the sugar were brought to the edge of ruin. They are degrees away from ruin. But because of their near devastation, they hold a whiff of redemption. They have experienced much and have been transformed because of it. What began as innocuous ingredients you often add to coffee have visited the flames of hell and came out as a new being, one with form and function. Our characters must do the same. They must feel the temperature rising, convinced the end is nigh. Their feet must be scorched and blistered from their travels. Pain is the main ingredient in transformation. The character suffering the burn of conflict can’t read the thermometer. She can’t even know it is there. Neither can the reader. The reader must feel ruin is possible. A second too long on the heat and all will be lost. The reader must taste the danger. 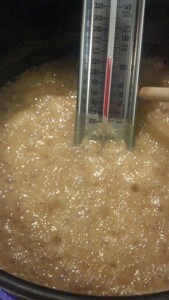 As my caramels cool, I’ll be turning up the heat on Aubrey and watching the thermometer. I am the only one who can see it. Brown the butter in a heavy sauce pan until brown bits form on the bottom of the pan. Watch carefully. Add corn syrup, sugars and cream, alternating. Bring to a rolling boil and insert candy thermometer. Stir occasionally. 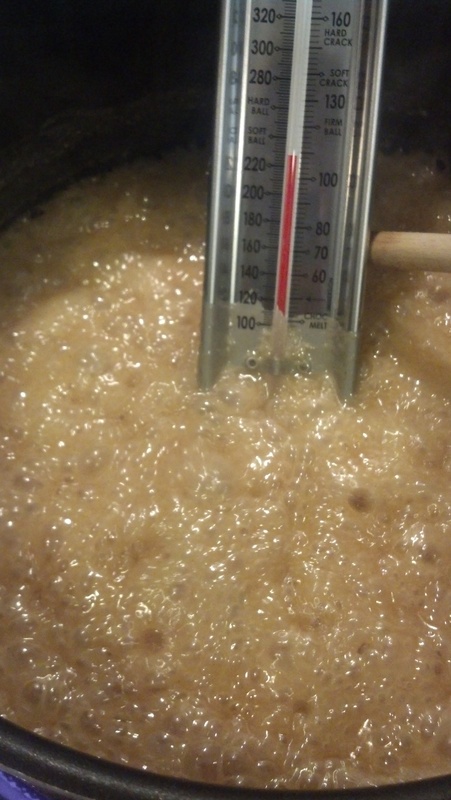 Boil to 240° for a softer caramel and to 250° for a firmer caramel. Remove from heat and add extracts, stirring r thoroughly. Pour into molds or a low buttered pan. Cool and cut. I often add a sprinkle of sea salt or a drizzle of chocolate to the finished pieces. Your caramels are to die for, but I will never be able to eat one again without wondering which character is melted and swirled within the rich, delicious ingredients. Did they survive their trial by fire? Do they understand what they have been through or are they still oblivious? Makes me feel a little cannibalistic! Looking forward to your next batch of caramel characters.